Among the many artifacts in Muskegon head coach Shane Fairfield’s office hangs a special picture: the Big Reds offensive line sitting on a bulldozer. 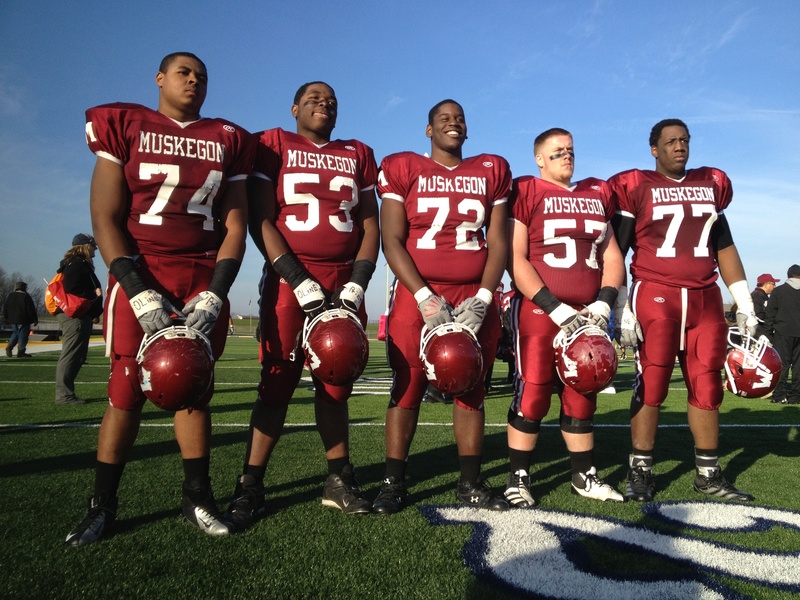 And just like a bulldozer, the 2012 Muskegon O-Line has paved the way for its team, all the way to Ford Field. The Big Reds are averaging 400 yards rushing a game. They’ve had many 100-yard rushers, including a breakout year for All-Lake fullback John King. They’ve had thrilling plays from quarterback Jalen Smith. But, the players you rarely read about in the paper or watch on the highlights are the ones who make it possible: the Big Reds offensive line. These guys are nasty and for our money, the best offensive line in the state. Week in and week out, the Big Reds offensive line has provided the consistency all great teams search for. Not only do they play with great technique, but they have a chemistry about them like a great symphony orchestra; everyone is on key. They’re also standouts in the classroom; each of the starting five boast a 3.2 or higher grade point average. Billings is the most physical lineman for the Big Reds; he’s just plain nasty. The offensive tackle plays the game with great passion and a motor that never quits. He has 70+ pancake blocks on the season and has not allowed a single sack. He’s also a gem in the classroom, ranking in the Top 10 of his class with a 3.9 GPA. Billings is currently being recruited by many of the GLIAC schools, and has potential to get a late MAC offer. The biggest member of the Big Reds OL may also be the most underrated. Physical, tenacious, and smart, Ricks has protected QB Jalen Smith’s blindside well. Like Billings, Ricks has not given up a sack this year. He’s very strong (330 lb bench/450 lb squat) and also carries a 3.2 GPA. He’s being recruited mostly by Division 2 schools, but has visited Northwestern. Put in the game film from when Muskegon faced Orchard Lake St. Mary’s earlier this season, and Crosby gives a clinic on how to play Center. Playing with good pad level and the ability to finish blocks with the best, Crosby has tallied 62 pancake blocks and zero sacks on the year. He is not only the leader of the Big Reds line, but of the whole team. He is being recruited by Division 2 schools and has an offer from Ferris State. He has also visited Harvard, and carries a 3.7 GPA. What Tozer lacks in height, he makes up for with his passion and tenacity for the game. After transferring to Muskegon in the middle of his sophomore year, Tozer has made big gains over the last two years. A very physical interior lineman, Tozer has great strength (335 lb bench, 500 lb squat). He’s a versatile player that also plays back-up Center when needed. Tozer is drawing interest from both Division 2 and Division 3 schools, and carries a 3.2 GPA. The only non-senior in the starting five, King’s development has been a delightful surprise for the Big Reds. Only 15 years old, the Jamaican-born King plays with the highest motor on his offensive line. He’s a great athlete with the ability to run side-by-side with skill players while blocking downfield. He’s aggressive and loves to “flatback” opposing defensive linemen. With 41 pancakes on the year, King has given up only 1 sack. His freakish athleticism and on- and off-field smarts (3.6 GPA) are a draw for BCS schools like Iowa, Wisconsin, TCU, ECU, Michigan, Michigan State, Indiana, Illinois, Baylor, Florida, and Ohio State. As his frame fills out, he could move to tackle at the next level.